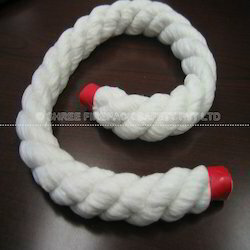 Exporter of a wide range of products which include ceramic fiber twisted ropes. ceramic fiber Rope,ceramic fiber tapes ,ceramic fiber cloth and vermiculite coated ceramic cloth. ceramic fiber twisted ropes are made from fine quality yarn twisted around in desired sizes. available sizes from 6mm t0 80mm dia. Looking for Ceramic Fiber Twisted Ropes ?